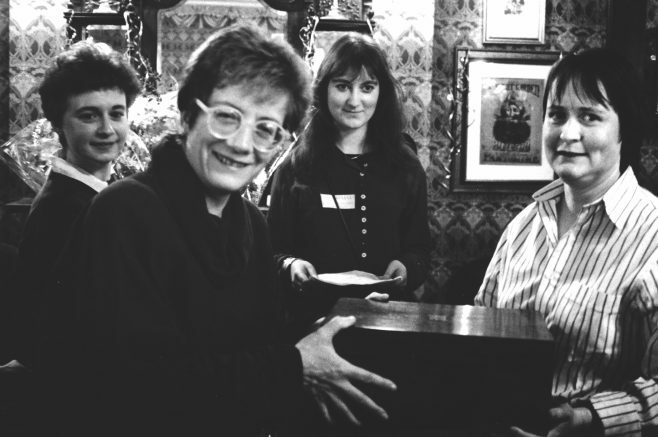 Photo above Paula Kahn (foreground left) presenting Sue Butterworth (right) of Silver Moon Women’s Bookshop with the Pandora Award in 1989. An early attention-grabbing development was WiP’s Pink Pig Award for the worst manifestation of sexism in publishing – the winner was presented with a pink marzipan pig. The media response was widespread but predominantly ribbing. To redress the balance WiP launched the Pandora Award in 1981 ‘for personal achievement and promoting positive images of women in publishing’, and in1988 the New Venture Award for women 'who have sought to promote underrepresented communities or groups in society’. Meanwhile women were beginning to break through the glass ceiling in greater numbers.